Special Offer: Free delivery is available when you order 3 items or more of selected products. BUY 3 TUBES (or more) FOR FAST, FREE DELIVERY! BioMin C is the fluoride-free daily toothpaste formulated to adhere to teeth and slowly release calcium and phosphate to replenish them. This helps to produce a protective layer on the teeth to reduce the risk of early decay, staining and sensitive teeth issues, though BioMinF toothpaste gives a much higher level of protection. 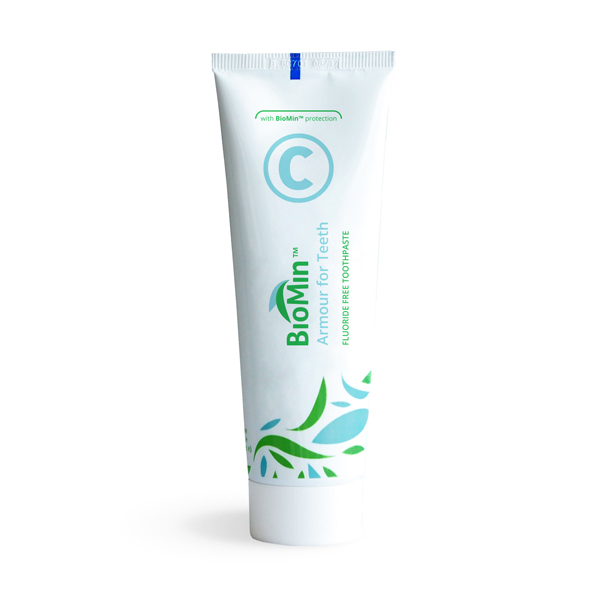 BioMin C is ideal for those who do not wish to use a fluoride containing toothpaste. The saliva within the mouth slowly breaks down the bio-glass structure to release the minerals. The formation of hydroxyapatite protective layer becomes particularly pronounced around the opening of any exposed pores in teeth (tubules) to help ease the pain of sensitive teeth, as well as areas under acidic attack from sugary foods and drinks. Brushing twice a day with BioMin C toothpaste will rejuvenate, reinforce and protect your teeth leaving your mouth feeling clean and fresh. Contains smaller, softer particles so is less gritty and abrasive on the enamel than other toothpaste. Has NOT been tested on animals and does NOT contain animal products, so is Vegan and Halal. I love this toothpaste. I've noticed how well it get rid of stains and how well it fights to keep your teeth looking good. I will never go back to any other toothpaste. I will keep using BioMin C forever. Thanks to the lads at Kings College for this amazing toothpaste. Keep up the good work. BioMin F Toothpaste Travel Tube 18ml.